We have some quick game balances and AI enhancements that we want to get out to you before the holiday. AI is more inclined to focus on fewer enemies even if it hates them in order to concentrate its might on individual enemies. AI will now use its colony ships, freighters and constructors to scout FOW areas rather than wait for scouts and other ships to uncover FOW. AI ships better at exploring for potential colony targets by exploring stars over the void. Crusade change: Unforgiving cultural trait gives a 10% empire-wide production bonus. Base game: Changed unforgiving text to get 5% which is the amount it actually changes in the base game. Could you please fix two problems that have been discussed on the Discord chat? 1. Train Celebrity actually trains a Diplomat instead of a celebrity. 2. The Mega Resort upgrade to the Stadium is in many cases a downgrade, since it takes away the Stadium's flat +3 morale and replaces it with a percentage +25%. The Mega Resort should instead keep the flat +3 (or make it +4) and add a percentage in addition. I started a new game without mods in a Large galaxy with Normal AI. I also used only the AI that come with the game. I was able to hire the Mercenary ship H12-Super so I could watch the AI near me. In this case it was the Snathi and Slyne. All their ships seemed to be scouting, but some of them would go out for a while then return to the planet where they started. They also had a scout or two that would eject from a planet one turn, go back in the next turn, then repeat. I didn't see any stacks of non-warships waiting at a planet like there usually were before this patch. The habitable planets that I found with the H12-Super that I didn't settle were settled in a reasonable amount of time. At turn 93 I used the Console to reveal the FOW to see how the galaxy looked. There were still 10 planets that hadn't been settled: 8 required Atmospheric Cleansing, 1 was Aquatic, and the other was normal. This normal one was all alone about as far from other planets as it could be, so maybe there hasn't been time for the AI to find it or to send a colony ship to it. It looks like the AI is doing a good job of finding and settling planets. One war has just started, so there hasn't been time to see what those changes have done. It's definitely playing a lot better. A lot of the exploration code was developed back before the pirates got as good as they are today. So the AI wasn't as vulnerable to having its exploration cut short. Most excellent. I really appreciate you and your developers continued support of GalCiv3. She's had some fits and starts along the way and, to be honest, I stopped playing for a while until things settled down but I think you guys are really starting to hit your stride now. I eagerly look forward to the new expansion. I have a better update almost ready to check in (won't happen until after the break) that improves AI transport handling. I'd like to add my thanks for this iteration which does feel a real step forward. Very nice (if sometimes vexing at the exact moment) to see some AI cities and more threatening enemy invasion fleets. Of course, the really big change was making cities prohibitive in the early game at least - and this has rebalanced building priorities since you need sufficient production to get them done in a reasonable period of time and so increase production... . This now looks close to a finished economy so please don't make too many more tweaks, which may unbalance the system again. Thank you. This game keeps getting better and better. Can you PLEASE get the ai to attack shipyards, I changed the dangerbellcuretagetdivisor to 2, as dividing a bell curve by 2 instead of 3 makes the area larger and the ai does seem a bit more aggressive when it is changed to 2. I really don't know if I am imagining that or not. If the AI would attack shipyards than it could really be challenging because early in the game when it declares war it can mash up your fleets but then it stops it doesn't go after your shipyards which could really put you out of the game. Regarding the AI going after shipyards, it does do that but it tends to do that only once it feels it has total supremacy. The 2.8 AI update will make this one look like a joke. However, it won't be universally positive because players were kind enough to send saved games and I found how they were getting 40 moves per turn. The entire pathfinding system was designed around maxing out at around 8 moves per turn. The turn times increase exponentially above 8 moves due to path finding tree searches. But there are a couple of planetary improvements the Arceans have that are just insane which I've nerfed pretty hard. In the long run, the goal is to keep the moves per turn <10 for the base ships (if you add engines, go ahead). On the bright side, the AI average ship speed at turn 200 has increased from 3.1 to 7.3. That's > than doubling. 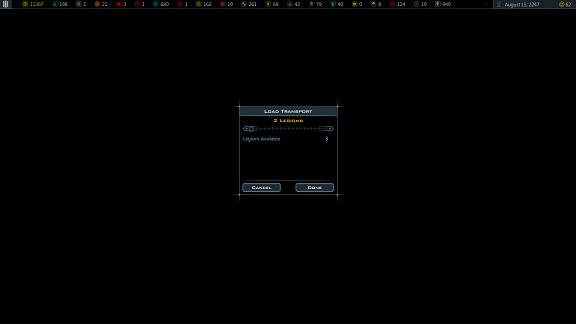 But there are a couple of planetary improvements the Arceans have that are just insane which I've nerfed pretty hard. I usually play as the Arceans because of the large number of moves I can get. I really liked having an unfair speed advantage over the AI. I'm really not complaining. It just means I'll have to adjust. I am capable of adjusting, so I will. I never built the third one. I chose the option that gave me +100%. I think it said it was to the base moves. I also think it gave +3 when I took it. It don't know if it became more than +3 due to later Research and Planetary Improvements. I'm not sure how all these numbers are added and multiplied to get the number of moves. I went into the Ship Designer and found that all starting hull sizes had 24.8 moves. The ships I was using all had large hulls, were all designed by the game and had one Ion Drive, which gave 3.1 moves. The ships had 28 moves, which would be expected from adding 24.8 and 3.1. When I put the ships in a fleet and added a Commander, the moves increased to 46. I was surprised by this since the tool tip says a Commander gives +100%, which would be 56 moves. If this gives you some more ideas on what to adjust, go to it. I should mention that I have been seeing some AI ships that have anywhere from 3 to 6 moves early in the game and 8 (I think) later in the game. Some of these AI are from the workshop, and some are the ones that come with the game. If you can get the AI to use Commanders with their fleets, it would make them faster and a lot more troublesome. The new patch is now out for more than a week - any chance for your gog.com customers to get at least a release date for when it will be available on gog.com too? It's ok to have the steam guys as beta testers to flush out the worst bugs but after a while we really would appreciate to also get the new updates! Thank you! The patch has to be tested and approved by GOG before it is released on their platform. Upgraded an existing duel transport troop ship (10 legion) and ended up with 12 troops. One of my troop transports is now has 16 troops. If you have a ship above astroid field and you left click it, ship will disapear and become invisible for that turn. You right click the astroid field to be able to see the ship again. Traveling in astroid fields and such are a part of the game, ships should never disapear from my mapview. Have a ship in astroid fields, left click it. It now disapears. You have to right click to make it become visible again. When invading planets you need Legions, now the mechanics itself is an interesting idea but it does not work! Transport function is bewildering and less intuitive. After building an transporter, when you load up all legions for the first time on transporter, there is no way that lets you station them on a planet OR shipyard again OR transfer them to other ships. The Legions are now stucked onto that single transporter you first loaded them onto. You can first only take 2, redock and take choose 3...ect. But its not reversible and once the transporter if full, you wont be able to undock the Legions anymore. They are binded to that transporter. When having Legion which is stationed at a particular base (planet/shipyard), I expect a feature that lets me see where they are. If you having a big system and does not load all Legion on your transporter you are up for a wild guessing game trying to find them again. 1. It appears that there is no mission for obtaining Monsantium, unlike all other other planet-based resources. I'm currently playing a map where it appears that there are possibly 2 planets (out of 100+) that have Monsantium, and the complete inability for virtually all civilizations to obtain this critical resource cripples everything. The missions are a great way to allow civs without a critical resource to obtain small amounts of it. In my case, Monsantium is in such short supply that you can't obtain it by trade, and since virtually all population expansion depends on it, 90% of the civs are stuck - the basic farms are so pathetic that you practically have to cover all planets in farms to be able to support a city on a few of your planets. The mission should probably be attached to either Planetology or Xeno Adaptation. Speaking of which, the per-level bonus of a basic farm is pathetically low: 0.1/level. That's ridiculously awful, to the point of where adjacency for farms is almost pointless. 2. I just colonized an Aquatic World. Which now appears to have a +10% Raw Production bonus (I'm a Terran). So what does the Aquatic World Mastery tech do now? There's no penalty to remove. Is this a Terran-specific bonus, or did something get screwed up for everyone? There is a mod for that, but it really should be something that is, by default, already a part of the game. Can you post/email the changed xml files? I.E. ImprovementDefs.xml, TechDefs.xml and such so the GOG users can get some benefit of the updates. That's where the multipliers were changed to flat rate.